The full promise of Big Data has yet to reach its pinnacle, but the potential is definitely there. When Big Data is leveraged for making better decisions, part of that promise is fulfilled. When Big Data helps you more accurately predict the future for better decision-making in the present, then you know you’ve arrived to everything we want to get from it. Predictive analytics have begun making their way into the realm of talent management, and I think it’s worth exploring how they might inform eLearning efforts as well. Who can forget the film Moneyball and how leveraging predictive analytics for better talent-acquisition decision-making led the general manager of the Oakland A’s to put together a team that achieved the biggest winning streak in the history of the American League. Needless to say, HR and talent management professionals sat up and took note. More and more companies are figuring out ways to leverage predictive analytics to inform all kinds of talent-related decisions, including predicting who will be star performers, leaders, and managers. For learning professionals, collecting at least some forms of data are (or should be) fairly common, such as post-eLearning course evaluations to gauge audience reaction to the content and learning environment, assessing what knowledge was gained and retained, all the way to behavioral changes that result from the eLearning and impacts on business results. Part of what is involved here is understanding how descriptive and predictive metrics differ. A descriptive metric is a snapshot of something that has already occurred, meaning it describes the past. At the end of an eLearning course or module, you administer some kind of survey to find out what participants liked and didn’t like about the course. But those snapshots of the past can be looked at a different way in order to predict the future as well. You’re still looking at historical data, but your mindset shifts into a different way of approaching the data, one that asks how it might inform future eLearning initiatives. Let’s say you start sifting through all your eLearning course evaluations from learners and you notice that people consistently give the interaction with other learners a low score. When you look at this historical data with a more predictive mindset, you essentially hypothesize that if you were to improve the opportunity for learners to interact with each other throughout a course, overall satisfaction among learners could increase. There’s only one way to find out: Experiment! If make clear improvements to learner interaction in your next set of eLearning content, the post-course evaluations will reveal whether or not you succeeded. 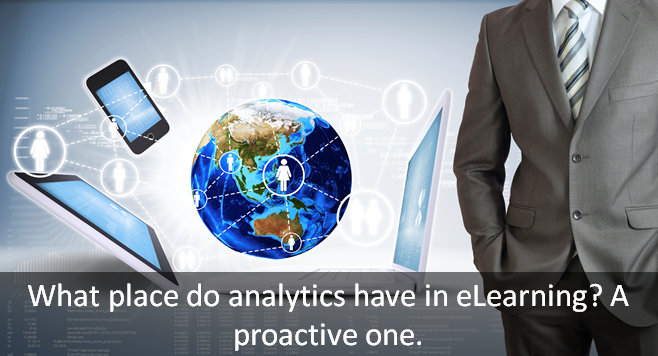 If scores increase, then you’ve leveraged predictive analytics for better decision-making in eLearning course design. This opens up a whole new realm of possibilities in making eLearning more effective, all by bringing just a slightly different mindset to the data you’re already probably collecting. As you can see from the hypothetical scenario above, it also involves putting together larger data sets than you may be used to dealing with. It’s not necessarily rocket science, but it can get very complex and unwieldy, which is why you need the analytical talent and tools to make the most of Big Data. You take a broad view and see what patterns emerge that seem to play a critical role in results, then formulate an action plan to address those moving forward. When you take the time to not only make sure you have the analytical prowess on board that you need but also cultivate a predictive analytics mindset and data-driven culture, you’ll be well on your way to fulfilling the promise of Big Data.